What Do Dental Inlays Do? At Magnolia Dental, we have received this question often: What is the difference between dental inlays and fillings? 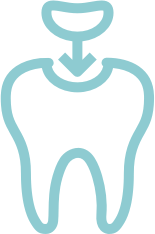 Dental inlays and onlays are actually the same restorative procedure, but they cover different parts of the tooth. The inlay covers the rounded edges at the center of the tooth’s surface. The onlay covers the entire biting surface of a tooth. Fillings are a restorative option for a tooth that is too damaged to support itself, but not damaged enough to warrant a dental crown. Onlays are often more durable than fillings, but are not always the preferred option. For more information regarding any of our services and dental treatments, contact Magnolia Dental today!